It’s really hard to make a living in the Apple App Store. It’s not impossible but neither is winning the lottery. People who aren’t developers don’t understand how hard software is to create and because of the Apple-influenced ecosystem, they expect software will be cheap or free. I have been thinking about how to be profitable in the App Store or better to avoid it altogether. I’ve discussed this with developer friends and it seems to be a challenge we all face today. Times are changing and in order to thrive we need to adapt. Conventional purchase, typically starting at $0.99 and ranging up to $4.99. Users seem to hate to spend even $0.99 when there is an acceptable, free, alternative. Advertising – display ads in your software and get paid when a user clicks on the ad. If your sales are small, there aren’t many people to look at these ads and less to click. In-App Purchase (IAP) – this seems to be a valid alternative to asking users for upgrades. IAP allows developers to bundle features and offer users these features for a fee. IAP is an approach I am considering for my current apps and future ones. The idea would be to give the basic software away and charge for “Pro” features. ?These pro features need to be real value to the user, no just take a crippled lite version of the app and enabling features users expect. I have experimented pricing for my apps. My main app is Palette Pro,?started out for $1.99 and did fine at release. I later changed the price to free for a short period of time to test the results, which were astonishing. Downloads for the free app was 1000x that of paid. This is pretty powerful and says a lot. Just like most developers, I can’t work for free. The only business models I want to work on any more have some mass-market component that is absolutely free, and a niche companion product that makes money off of the exhaust fumes of the mass-market component. The last two businesses I started are Stack Overflow, which is free, where the careers business on the side makes money on the small fraction of Stack Overflow users who are looking to get better jobs, and Trello, which is free, but the business of providing administrative tools to large organizations using Trello can sustain the whole business. This is more than just “freemium” or “advertising-supported.” Freemium and Ad-supported business models are special cases of this general model. The real insight is that the free product has a chance to reach an enormous audience which provides distribution/advertising/marketing making it trivial to go to market with your paid product. What Marco is reporting here is that the old-fashioned “make something and get people to pay for it” business is much harder to pull off and likely to always be left in the dust by someone making the same thing for free, getting 100x the user base, and getting 1% of them to pay for some value added feature. Apple has so far refused to listen to the developer community for app upgrades. Today, when a developer releases a new version of their app they are not compensated. Small updates are fine and expected, but full an upgrade that takes developers weeks or months are hard to justify spending the precious development time and see no immediate return. If a user purchases an app, they receive free-for-life upgrades.? The only way today to get paid for upgrades is to create an entirely new app in the app store. People have to pay the full-price for the mew features. This is great for developers but not appreciated by users. ?Realmac Software, developers of the Clear to-do app for iOS and the Mac, attempted this recently and it was not well-accepted. So,?Realmac back peddled on their decision. David Smith has a great episode of Developing Perspective where he talks with a Clear user (his wife) about her thoughts on the Clear upgrade attempt. If her thoughts represent how most users view software on their mobile device; upgrades are not worth pursuing. Personally, I think this is a great way to get paid for upgrades. Users don’t have to buy, if their current version does what they need then just keep using what you have. This is how software has been sold over the years; you have version, here’s an upgrade, don’t buy it if you don’t want it. Users don’t favor this approach. I?ve gone back and forth on what Overcast?s business model should be. I?m definitely charging customers directly (rather than venture-capital or ads), but I?m still debating where, how, and for what. I?m sure of one thing, though: the market for paid-up-front apps appealing to mass consumers is gone. If you have paid apps in the store, you?ve probably seen the writing on the wall for a while. That model made sense when there were fewer apps available, but now that there are plenty of free and good-enough versions of almost anything, it?s a different game. 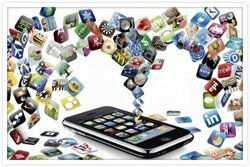 Apps targeting niche markets can still find enough paying customers to stay alive if they?re much better than any free alternatives, but the number of apps in that situation is always shrinking. I don’t think we will see an upgrading pricing structure any time soon from Apple. ?The company wants apps to be free and let developers figure out how to run the business side of things. The art of pricing combined with making a living with mobile apps has been on my mind for a long time. ?Recently my thoughts have become a bit more tangible. The reality is, most apps will be free. ?Most people with make money giving their applications away, while getting the most attention, ?then offer premium services with In-App Purchase. ? One aspect I haven’t mentioned but believe is probably the best way to realize the value of mobile applications is to offer applications for free but consume a paid backend. ?A Software-as-a-Service (SaaS) backend is offered for some monthly fee and the mobile application is simply a client of the SaaS app, just like a web browser. ?The beauty and simplicity of this approach is that it works for apps in the Apple app store but also on Google Play and the Windows Store. It’s interesting where this is going but things are pretty clear; developers need to change their approach to how they earn their living in mobile. The New York Times had a great article this past weekend titled?As Boom Lures App Creators, Tough Part Is Making a Living. ?As the title indicates, the life of a mobile developer is not often the glamor we hear about. ?The million-dollar jackpots are few and far between and are more difficult now than in the early days of the Apple App Store. The article chronicles the two very different levels of success; one, Ethan Nicholas who created the iShoot game and made over $1 million in 2009. ?The other part of the story is a couple who worked full-time on a handful of applications focused on children. The Grimeses? quest cost them more than $200,000 in lost income and savings. So far this year, their eight apps have earned $4,964. When the newest iPhone came out at the end of September, the couple immediately bought two.? I can attest to the same experience as the couple who lost it all. ?I didn’t let it go that far but having an idea, creating an application over a couple months and receiving very little return for my efforts?followed a similar path. ?In hindsight, I shouldn’t have been surprised.? The app store is stocked with so many applications it’s almost impossible to stand out in the crowd. ?Unless you are well-funded and can afford a lengthy and costly marketing campaign you will likely be cast to the abyss that is the app store. ?Those lucky few will be selected by Apple to be promoted on the store, to be glorified in iTunes and will go on to nice rewards. This is not the path a smart business person should travel. ?Developers are smart, we work hard and just want to be rewarded for our efforts. ?It is because we are smart that we should step back and think about the path of one-time customers greedily parting withe their $2.99, $1.99 or, I shudder to say, their $0.99. ?We can’t support our families with these measly morsels. Creating applications for iOS and Android are fun and very rewarding but these platforms should not be the island for your application. ?The people building businesses in this space today should be cleverly thinking of ways to monetize their idea without the goal of hitting gold but rather building on a customer base willing to keep giving you money. ?How many applications can someone create, sell for $0.99 and get a lifetime return of $5,000?if you’re lucky? ?This is not even breaking even, it’s a really weak business model. The better approach is solving real problems for someone who is willing to give you money to ease their pain and continue this on a regular basis. Mr. Nicholas and a friend, Brent Miller, were inspired to form a company. ?We were going to make another million or two,? said Mr. Miller, 38. But when none of their new games sold like iShoot, the pair moved in an entirely new direction. They founded echoBase, a start-up with 14 employees that is developing apps to allow doctors and nurses to view and update medical records across different computer systems. They brought in Mr. Miller?s father, Rod, a former I.B.M. sales manager, as chief executive. This is an example of a solution to a real problem, making the life of doctors better and at the same time providing accurate and reliable care to the patient. ?The application is free on the App Store but it’s very clear in the description that a server piece is also needed. ?I am sure THIS part is not free. ?This is someone who has made it in the App Store but realizes it’s not easily reproducible. ?This should be the type of applications we are creating, ones that create a revenue stream for developers but also add real value to users.? An organization like echoBase has iOS client software and some generic server piece which opens the doors to using other clients as well. ?Anything from Android and Windows RT to web and rich Windows Desktop apps. ? The Apple App Store is very different today than it was in 2009 but it still holds great value to the people who are smart and don’t try to play the app lottery.? The intense competition for mobile engineers, which affects large companies and fast-growing start-ups alike, is emerging as a key bottleneck as companies scramble to capitalize on the fast growth of smartphones and other mobile devices. I wondered when we would start reading reports of such problems. ?With Apple, Microsoft and Google releasing new version of their respective mobile operating systems and selling handsets at a blistering pace, companies see the obvious opportunity. ?The opportunity may be there but developers are hard to find regardless of the technology. ?This only makes it harder. Developers today should be looking at each of the big companies and learning some aspects of one or more platforms. ?Even if only learning a cursory level of the platform, enough to speak intelligently about the technology can go a long way. The mismatch has put upward pressure on wages. According to an October survey by tech job board Dice.com, about 31% of companies reported that average pay among mobile software designers and engineers increased at a higher rate than normal, mostly because of heightening competition for talent. The Dice survey said the average mobile salary last fall was about $76,000, but several companies said they pay experienced mobile developers anywhere from $90,000 to $150,000 a year. 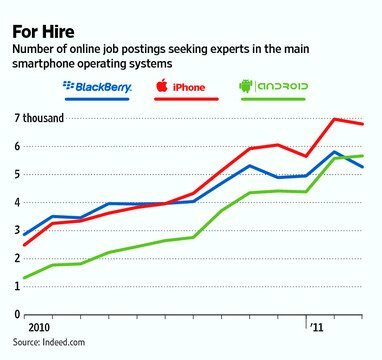 The exception here is BlackBerry, which seems to be declining. ?I think Windows Phone 7 will be replacing some of the BlackBerry development and being a viable mobile development platform going forward. So, instead of watching re-runs of Gilligan’s Island this weekend, get out and read about these platforms and explore some code. ? If demand is growing at the pace we see here, there is no time like the present to bettering yourself. I know I will be spending some extra time learning a bit more about the new updates to Windows Phone 7 announced at Mix 11. When Apple announced the ability of content providers to offer in-app purchases of their goods, newspapers and magazines breathed a small sigh of relief. ?The Internet age has left traditional print a bit in the dust. Over the recent weeks I have noticed several old-school publishers, The Economist in particular, offering their magazine to subscribers as iOS application. ?A user grabs the app from the Apple App Store and when running it they can purchase a single issue or become a subscriber right while in the app. ?How convenient is this? ?I love it. 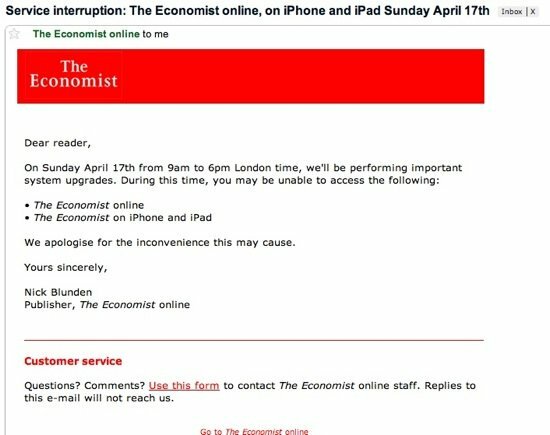 Interesting..I may be unable to access The Economist on iPhone and iPad. ?Why should this be? ?If I downloaded the issue to my iPad I should be able to read the purchased content regardless of their backend. Maybe they embed some analytics, make calls to a server or display ads served from their servers, but that should not render my reading experience useless. ?I should be able to be in the most remote part of the world, or on a plane for that matter, devoid of WiFi or cell service and be able to read my copy of The Economist without issue on my iPad. If mobile applications offering content to me aren’t going to be able to function without Internet connectivity, they are going to fail. ?I would not buy a subscription or a single issue if I can’t acquire the content and have no further obligation from the publisher. I see no legitimate reason I should be required to have a connection to view my purchased content, from any application, any time or place. Marco Arment had a great and timely post about the future of Android over the weekend. ?It’s timely because I had just gone through the whole iPhone on AT&T to Android on Verizon to iPhone on Verizon journey and his words rang true. ?I had just wrote about the experience last week. We?re talking about Android? which has terrible development economics hindered by severe frag mentation and poor payment integration, and is not generally used by most of the influential people needed to spread the word on new services. It looks like the Verizon iPhone launch is helping iOS hold its own with 25% of the market. I expect (and hope) that iOS will remain a strong competitor to Android. But as I’ve been saying for several years now, I believe the mobile OS market will play out very similarly to Windows and Macintosh, with Android in the role of Windows. And so if you want to be in front of the largest number of users, you need to be on Android. He points out the Verizon iPhone launch is helping iOS hold its own. ?I think we won’t see the impact of the Verizon launch for a while since people (like myself) moved to Verizon for a smartphone and Android because AT&T has such lousy coverage. ?I forced the issue and bought an iPhone off of contract, because I could, but I am sure most can’t or won’t go this route until their contract is up. ? I predict a wave of users move to iPhones from Android on contract renewal. We don?t really know, of course. But it?s worth considering. Were they choosing to buy an Android phone, or were they choosing to buy the most iPhone-like option in the Verizon store? If the latter, what are they likely to choose next time? If Android phones were delighting its customers and building loyalty after the purchase, it would be reasonable to conclude that a lot of its existing customers were likely to continue buying Android phones in the future. So how is that after-purchase experience? How much do mainstream buyers like their Android phones? I am one of those buyers and I did not like the Android phone one bit. ?Battery life alone was enough for me to take issue with it. Google seems to recognize fragmentation is an issue with Android because they have decided to hold back the source to Honeycomb. ?Wait, I thought Android was open? ?Well, not so fast all you developer out there..it’s only open as long as Google says it is. So, who can champion Android to real success? Amazon maybe? They have the infrastructure and ability to make it happen and the opening of their Android app store is probably a good sign they have intentions. ?Amazon has a great device in the Kindle, so how hard would it be for them to produce a tablet with great hardware like the Kindle? ?They certainly have the distribution channel, lots of books, MP3s and now apps. So while Android?s currently doing well, investing heavily in it for anything with long-term costs and obligations should be carefully considered. If you?re not in a rush to make such predictions, I?d wait and see what the market looks like 18 months from now. I won’t be putting any resources into Android development. ?iOS holds so much more opportunity at this point and with limited resources you have to go where the money is.